120 • RV PRO • November 2018 rv-pro.com B U S I N E S S from the management team and who doesn't. The manager now must deter- mine what is causing this technician to underperform. The cause of poor performance on the part of your technicians is not always an easy thing to determine. The easiest way to get started is to simply sit down in a one-on-one meeting with a technician and ask this simple question: "Why do you think your productivity is below our minimum performance standards?" You might be surprised at what you hear, so remain open-minded. Keep your mouth shut and listen. You see, you simply can't rely on the numbers (hours produced) to tell you everything you need to know to be an effective man- ager. You must determine what is causing the low productivity. Here is an example: I had just com- pleted a shop meeting with all techni- cians at a dealership in the Midwest when a very polite technician walked up to me and said, "I am the top technician in this shop. I have the most experience, I have the most training, and every other tech comes to me when they need help, and I don't have comebacks – but I will never reach 120 percent productivity." I asked why not, and he responded, "Because all I get is warranty work and zero customer pay or internal." So, here is a very talented technician, with a great attitude who never sees a customer pay repair order. The service manager here deserves a trip out behind the woodshed! This technician is not being treated fairly, and given that he is a flat-rate tech, his earnings are adversely affected by this manager's failure to identify the cause of his low productivity. Correcting the cause of this technician's condition was a very easy thing to do, which of course is called the correction. The correction is not always up to the technician. In this case, the dispatch pro- cess was the cause, and once corrected (it took five minutes), his productivity shot up to more than 130 percent. It also gave him a big pay raise (more flat-rate hours), it produced more gross profit for the dealer and I made a friend for life. It sounds like everybody won! Another example would be lack of tools or lack of the proper equipment, which in many cases the technician has no control over. Sometimes you may have the proper equipment, but the technician does not know how to use it. Obviously, this can be corrected with training, so this must become a top pri- ority for your management team. Additionally, you may have the proper equipment, but you need more based on the number of technicians who use that equipment. Sometimes, your equipment is outdated and needs to be replaced, so again, that must be a top priority for management. 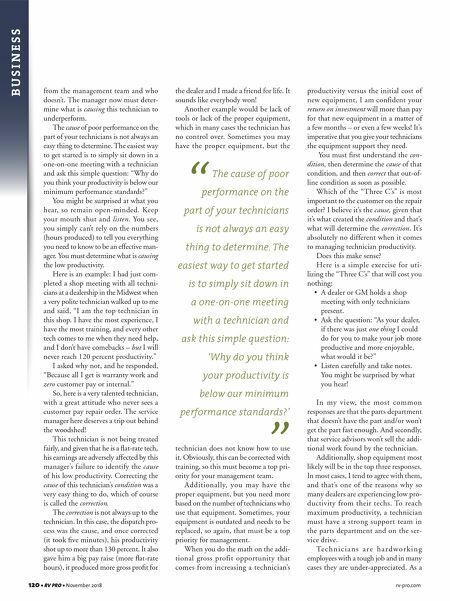 When you do the math on the addi- tional gross profit opportunity that comes from increasing a technician's productivity versus the initial cost of new equipment, I am confident your return on investment will more than pay for that new equipment in a matter of a few months – or even a few weeks! It's imperative that you give your technicians the equipment support they need. You must first understand the con- dition, then determine the cause of that condition, and then correct that out-of- line condition as soon as possible. Which of the "Three C's" is most important to the customer on the repair order? I believe it's the cause, given that it's what created the condition and that's what will determine the correction. It's absolutely no different when it comes to managing technician productivity. Does this make sense? Here is a simple exercise for uti- lizing the "Three C's" that will cost you nothing: • A dealer or GM holds a shop meeting with only technicians present. • Ask the question: "As your dealer, if there was just one thing I could do for you to make your job more productive and more enjoyable, what would it be?" • Listen carefully and take notes. You might be surprised by what you hear! In my view, the most common responses are that the parts department that doesn't have the part and/or won't get the part fast enough. And secondly, that service advisors won't sell the addi- tional work found by the technician. Additionally, shop equipment most likely will be in the top three responses. 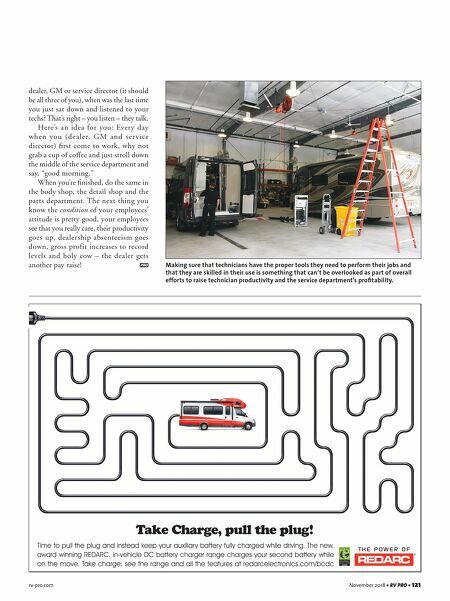 In most cases, I tend to agree with them, and that's one of the reasons why so many dealers are experiencing low pro- ductivity from their techs. To reach maximum productivity, a technician must have a strong support team in the parts department and on the ser- vice drive. Te c h n i c i a n s a r e h a r d w o r k i n g employees with a tough job and in many cases they are under-appreciated. As a The cause of poor performance on the part of your technicians is not always an easy thing to determine. The easiest way to get started is to simply sit down in a one-on-one meeting with a technician and ask this simple question: 'Why do you think your productivity is below our minimum performance standards?' " "